Barb and Biff M with their nice looking yellowfins. Fred Brandt from Seeker Fishing Rods giving us a great wave good bye. Anglers patiently awaiting to board. Anglers bring all their tackle aboard. Fred from Seeker Fishing Rods showing us how much of the rail you need. We had the game on for the anglers to relax too on a Sunday morning. Gone fishing for 7 days. 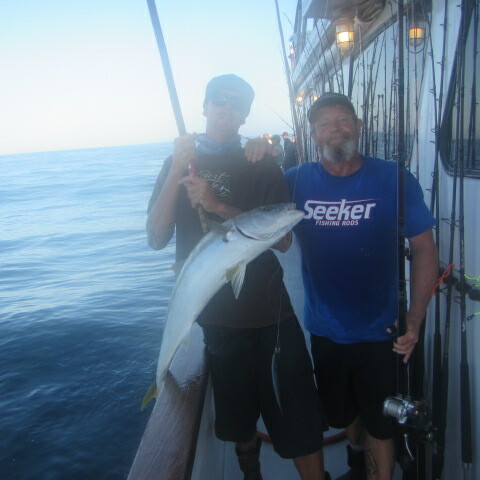 Austin (Ace) caught a nice yellowtail with his vintage bamboo rod and reel. David T with his yellowfin tuna from today at the Ridge.